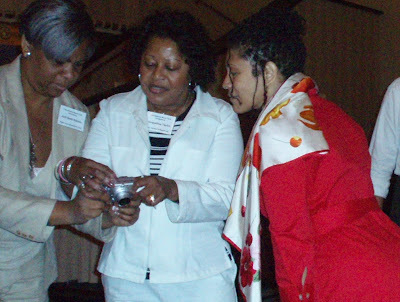 As we mentioned in Monday’s blog, we spent last weekend in Chicago at the National Book Club Conference Click here: National Book Club Conference , presented by Black Issues Book Review Click here: Black Issues Book Review . The conference is usually in Atlanta in August, but this year, NBCC founder Curtis Bunn arranged for the event to take place in Ghana. We understand it was a life changing journey and that Curtis had the ultimate hook-up—a college classmate of his is a Ghanaian king, so the group was treated royally! (There will be tons of photos and info about the trip on their site in a couple of weeks). Chicago presented an opportunity for those who were unable to make the trip to Ghana to get their book club/author fix. Probably because it was the first year, attendance wasn’t as robust as it is in ATL, but that also meant the weekend was a lot more intimate. We arrived on Friday—after an uneventful plane ride—an amazing feat these days, but Chicago was still reeling from some UGLY weather—storms the day before had caused downed trees, flooding, and power outages. Now Chicago traffic is usually no joke, but it took us 2 ½ hours to make the usually 35 minute drive from O’Hare to downtown in a HOT taxi—there was an oscillating fan clipped to the safety partition, blowing HOT air. Then there was the heat coming from under the seats—nobody wants a hot seat in August. But we got to the hotel in plenty of time to freshen up for the welcoming reception—a casual gathering for the early arrivers on Friday evening. All in all it was a great weekend. Not only did we get to hang out with readers and writers from around the country, but we also got to meet Eddie Levert and co-author Layah Beth LeFlore—who talked about I Got Your Back, the moving father-son collaboration that was finished right before Gerald Levert’s untimely death. 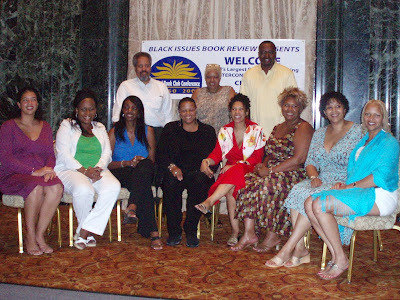 For those of you who belong to book clubs and haven’t attended one of the Atlanta events, we highly recommend you check it (and the author line up for 2008) out. And for those of you who are regulars—see you in Aug 1-3, 2008 in ATL!! We just made arrangements to be there too! telling us about the trip to Ghana. mysteries of the digital camera! What a great conference! It was such pleasure to meet you both... and, yes, let our hair down at dinner. What a treat. You're right; we authors really work in isolation, so it's a wonderful gift to spend sister-time together and connect as writers and readers. And folk. Thanks for your very kind words about my reading. 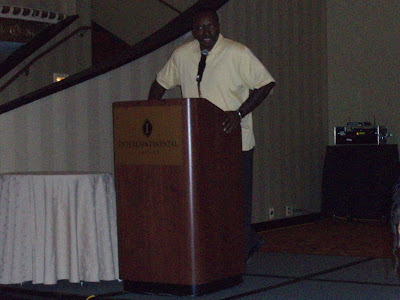 I really enjoyed everyone at the conference and loved the intimate setting Chicago offered. Meeting so many avid women readers was sheer pleasure. Thanks to Susan McHenry and Ken Smikle for making the event possible.